Contains 6PT sizes: 1/4" X 5/16", " X 7/16", 1/2" X 9/16"and 12 PT sizes: 5/8" X 11/16" & 3/4" X 7/8". The Crescent 8 in. Locking Flex Ratcheting Adjustable Wrench is our most versatile adjustable wrench yet. The jaw is able to pivot around the fasteners providing smooth ratcheting action to this wrench. The handled the handle flexes 180 to give you superior access at any angle. The combination wrenches in this 11 piece set are precision broached for a tight and secure fit. The jewellery-like mirror chrome finish provides outstanding corrosion resistance as a result of our proprietary in-house plating process. Made in Canada and backed by Gray Tools hassle worry-free lifetime warranty. Husky's reversible ratcheting combination wrenches feature a 72-tooth ratcheting box end that needs only 5-degrees to engage fasteners and a reverse lever for making quick directional changes. Each wrench is manufactured from chrome-vanadium steel and heat treated for added strength and wear protection; providing durability for a lifetime of hard use. Their polished chrome finish resist rust and corrosion and easily wipes clean of oil and dirt. Both the open and box end features chamfered lead ins for quick and easy placement onto fasteners every time. 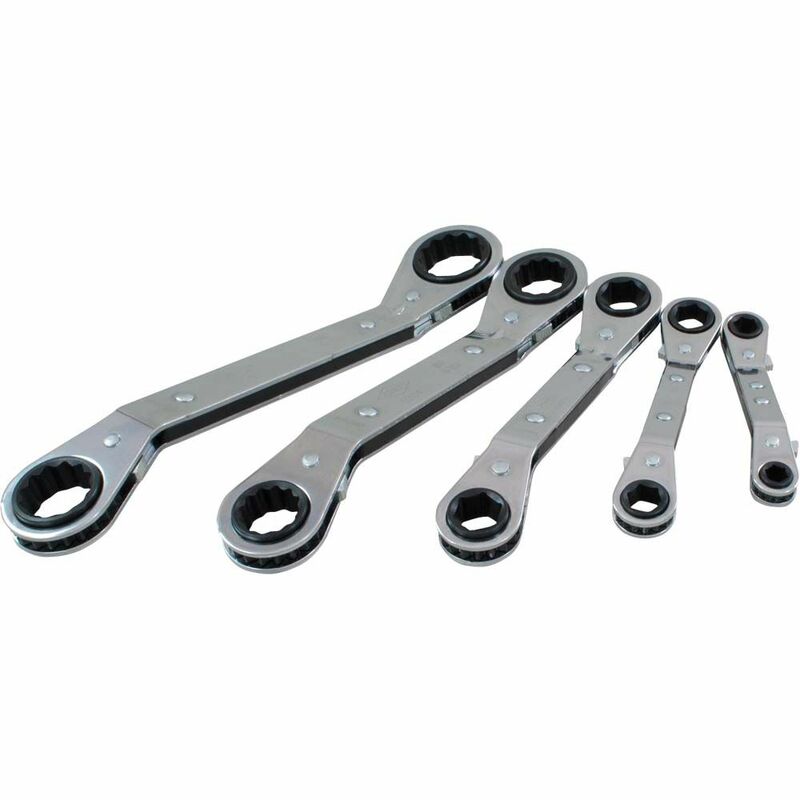 5 Piece 6 & 12 Point, 25 Offset Ratcheting Box Wrench Set, 1/4 Inch X 5/16 Inch - 3/4 Inch X 7/8 The ratcheting wrenches in this 5 piece feature a 25 degree offset which makes them ideal for use on hard to reach or restricted access fasteners. The chrome finish provides excellent protection against corrosion. Made in USA and backed by Gray Tools worry-free lifetime warranty.